Price is per square metre of tiles (m2) Tile category: Travertine Honed and Filled Product Information:- Also known as noche (noce) travertine or brown travertine the rich coffee and cream colour blend of these travertine tiles create a fantastic colour range to work from. 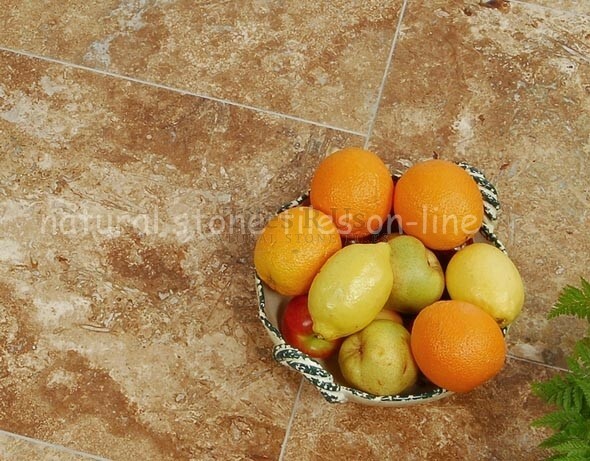 The quality of this travertine makes them ideal for floors or walls. Honed & filled finish provides a stylish smooth surface, which gives an exquisite look and feel. We suggest for this tile: Adhesive: Flexible standard set or fast set adhesives Grout: Flexible narrow joint grout or flexible wide joint grout Tile Sealer: Mattstone tile sealer Tile Cleaner: Grimex stone tile cleaner Tile Maintenance: Waxwash Click here to check our TILING ESSENTIALS including tile sealer, tile cleaner, tile adhesive and tile grout; we only supply carefully selected Tiling Essentials for Tiles R Us. Click here to check our NATURAL STONE TILING MADE SIMPLE guidelines and tips - Tiles R Us are unique and natural make sure you get the first step right and you will be very pleased with your stone tiles project. Under Floor Heating: Click here to see all the details and options available in our Comfy-Toes UNDER FLOOR HEATING range Warm comfortable feet - absolute heaven in your kitchen, bathroom, shower room or conservatory! Don't miss the chance to check our low cost, high quality range of floor heating systems.